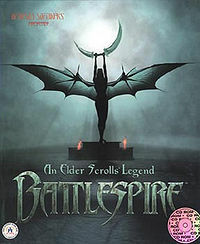 Battlespire is the first (and only) game in the spin-off series called An Elder Scrolls Legend. It was originally conceived as an expansion to Daggerfall, but evolved into a standalone game. The action takes place within a single multi-level dungeon, the Battlespire, where the player is sent to investigate some unusual events. It also features a multiplayer option. Character Creation — Explanation of how to create your character. Intrinsic Classes — Lists all pre-defined classes along with their skills and specifics. Races — Detailed information on races. Quest Walkthrough — Stuck on a level? Your question may be answered here. Multiplayer — Information on the multiplayer mode. Magic and Spells — Description of magic and spells in the game. Enchantments — A list of the various enchantments found in the game. Books — Catalog of all books found in the game. Items — A list of items found in the game. NPCs — A list of NPCs found in the game. File Area — Your one stop to all the latest editors, utilities, patches and other Battlespire related files. Screenshots — Contains several nice screenshots of the game and a few released animations. Videos — Contains a few gameplay videos from around the internet. Unofficial FAQ — The unofficial FAQ of the game answering some of the commonly asked questions. Development Team — The Battlespire Development Team. Hints/Tips — All kinds of gaming playing hints and tips. Links — Battlespire specific sites. Bugs — Lists the found bugs in the game along with any solution if applicable. Letter from Bethesda's President — An insert included with the game, explaining the idea behind Battlespire and Redguard. Running Under DOSBox — A detailed guide to playing Battlespire on DOSBox under a modern operating system, including OS X, Linux, and Windows 2000/XP/Vista. Technical Info — Information on bugs in the game, how to avoid/correct them, error messages, and possible methods on making the game run faster.